In just another 3 or 4 months you could be carrying a bag that will be able to charge your mobile, iPod or even your laptop. Konarka Technologies has launched the Power Plastic 20 series that are a new line of solar panels for portable charging applications. 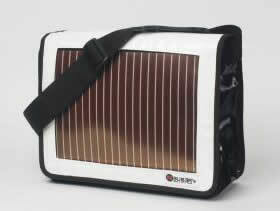 The solar company has developed a flexible photovoltaic material that converts light into energy. This can be used in carrying bags, café umbrellas and battery chargers for lighting, mobile phones and other mobile devices. The Plastic Power 20 series has three solar panels, Power Plastic 120 which has 1 watt, Power Plastic 320 having 3 watts and Power Plastic 620 having 7 watts. These panels come in varying sizes and can come with or without the integrated connectors that has to be used to connect the panels into a manufacturer’s product or device.